The Question Still Remains: Will Nice Guy Jim Thome Play Another Season? Jim Thome is a nice guy. This is a statement that nearly everyone who has played with him could agree with. This is despite the fact that, at one times, fans of the Cleveland Indians booed him and hurled insults that he was a traitor. The fact is, that despite that, Thome continued to let his talking happen on the field, as he put on a Chicago White Sox uniform and continued to show leadership and kept hitting the ball out of the park. He continued to show that stoicism as he played for other teams, and despite injuries that seem to come fast and furious once you cross the age of 40 in the game of major league baseball. He may be a good guy off the field and in the clubhouse, but he is also a fierce competitor on the field. He is, without a doubt, a powerhouse hitter and his stats are likely to cement him firmly in the Hall of Fame, while his good deeds and calm demeanor off the field cement him into the positive side of the Hall of Public Opinion. Thome probably gets his work ethic from his roots. He was born in Peoria, Illinois, which is, and always has been, a working class, blue collar town. When he got into baseball he played for a variety of teams. 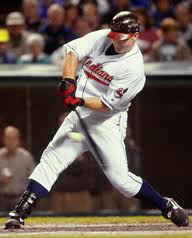 He made his initial mark with the Cleveland Indians between 1991-2002. Then he switched leagues and play for the Phillies from 2003-2005. He earned the ire of Cleveland fans when he returned to the American League to play with the White Sox from 2006-2009 After that he played for the L.A. Dodgers, and then went back to the Indians and, in 2012, back to the Phillies. During that career he has amassed 605 home runs, 2,295 hits, 1,677 RBI and 2,500 strikeouts. The problem is that Jim Thome is in his 40s. He is now 42-years-old and when it comes to baseball, he might as well be 100 years old at that age. His last several seasons have been marred by injuries, including a persistent back problem that routinely sidelines him and sends him to the DL. Despite a 2012 season that was respectable, including a run into the post-season, more injuries followed. This has led many to question whether or not Thome will return for another season in 2013, and for some to wonder if he should even try. As of right now, Thome has remained silent. Reportedly he is weighing his options and considering what is best for himself and his family. If he would decide to play, fans would likely welcome him back, but the question is still hanging out there. What will he do? Right now, there is no answer. Thome has remained stubbornly silent during the off season so far. However, after the turn of the year, the teams will start looking ahead in earnest and let us not forget that pitchers and catchers show up for Spring Training as early as February. At that point, we may hear more about Jim Thome. Will he be satisfied with his stats and his career and bow out? Or does he feel he still has more to prove and more records to break and go for it again in 2013? Right now, we’ll just have to wait and see.